Our Italian Food, Wine & Travel group is ready to share with you another one of Italy's marvelous regions. This week and month we share with you the region of Molise. Molise is an obscure region more towards southern Italy. 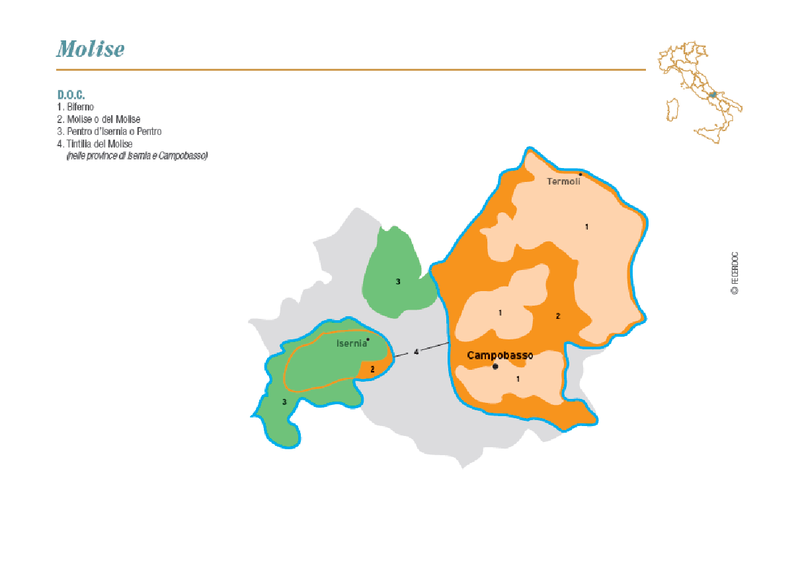 It is the 2nd smallest region and least populated in Italy next to the Valle d'Aosta tucked in northern western Italy. Dominated by mountains and barely touching the coastline of the Adriatic it's a lesser inhabited region and is dominated by the agricultural industry. Molise had been part of most of it's surrounding regions including Puglia and Campania to the south and Abruzzo to the north until it stood independently in 1963. It's 2 main provinces are Isernia and Campobasso. Most of the wines of Molise have always been locally consumed and it's one of the regions where the wines don't have a strong international presence. With influences of the Adriatic and the Appenine mountains, it creates an overall continental climate for grape growing. You'll find many of the same grapes of the neighboring regions also grown here including red grapes like montepulciano, aglianico, and sangiovese along with white grapes such as trebbiano, greco bianco, falanghina, chardonnay and sauvignon blanc. One of the native grapes of this region is the tintilia grape that is used in the production of the Tintilia del Molise DOC. Due to it's proximity and previous association with the surrounding regions, it shares very similar culinary similarities to those regions. Sheep are a staple in the cuisine in both lamb dishes and sheep's milk cheese. Since the region is more mountainous you'll find more meat based dishes here than seafood. Along with the lamb you'll also see lots of salami and prosciutto. Our bloggers this month will be taking you through an array of Molise has to offer. Here's a preview and please join us for a live twitter chat this Saturday March 5th at 11am EST at #ItalianFWT. If you'd like to join our Italian Food, Wine & Travel group and write about varying monthly regions of Italy please email me direct at vinotravels at hotmail dot com.